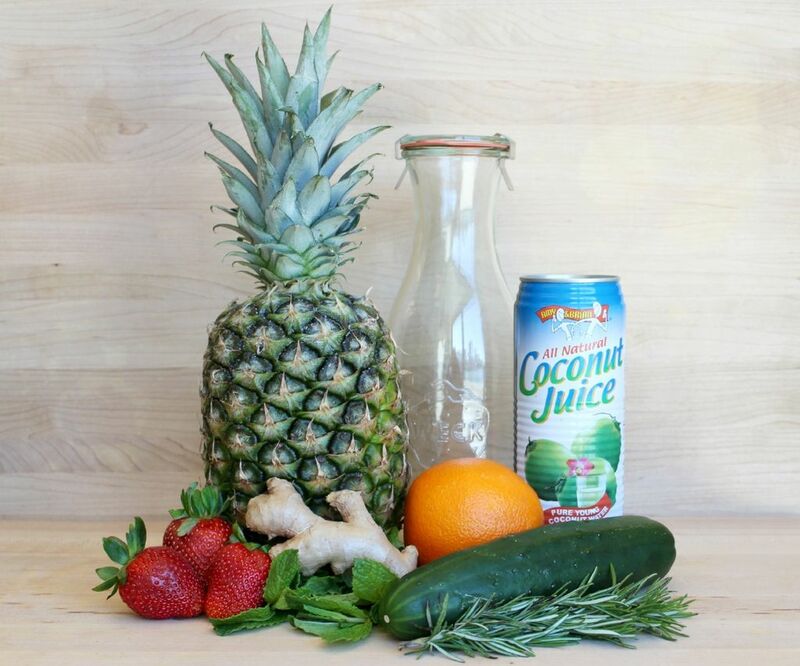 Natural flavoured water using fruit and other fresh ingredients! The key to a happy body = hydration. The key to happy hydration = flavoured water! Making fresh and sugar free flavoured waters at home is a great way to trick your household (including yourself) into drinking more water AND an easy way to save money and avoid bottle waste. 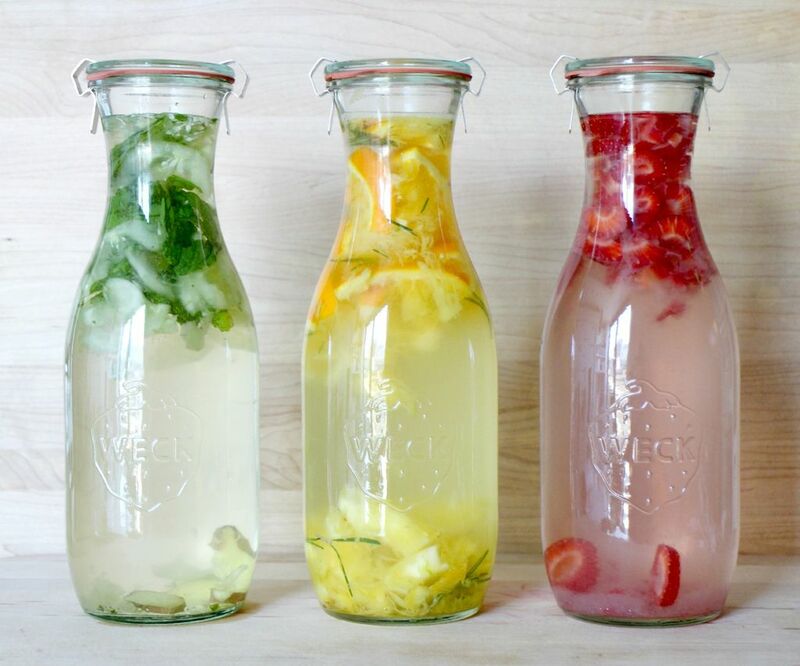 Here are some tasty flavoured water recipes that will keep them coming back for more! 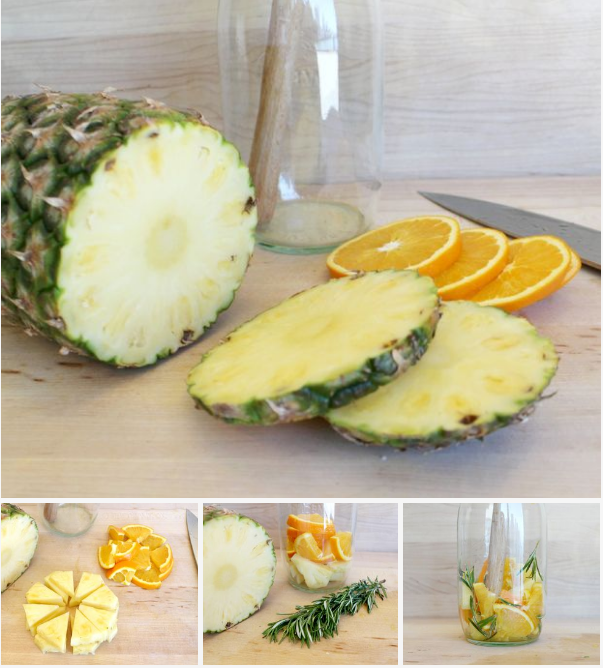 There are tons of great ways to jazz up water. You almost can't go wrong when picking a fruit or grabbing a fresh herb. I'm going to share my favourite three recipes, and then offer a list of other suggestions to try in the last step. 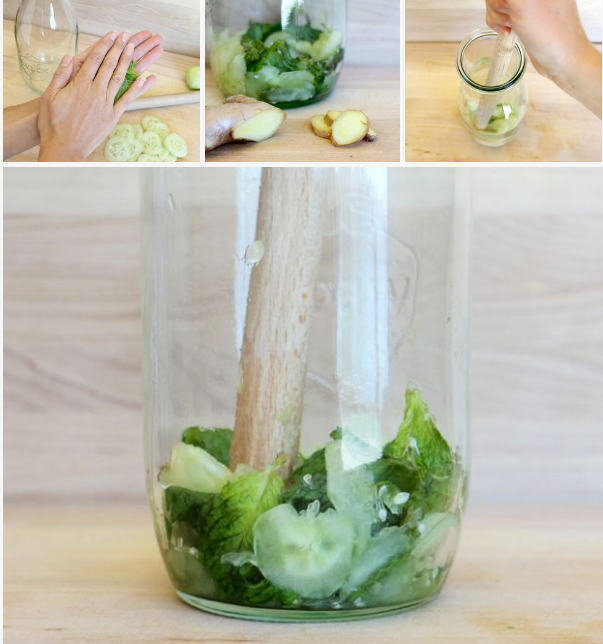 Peel your 1/2 cucumber and cut it into thin slices. 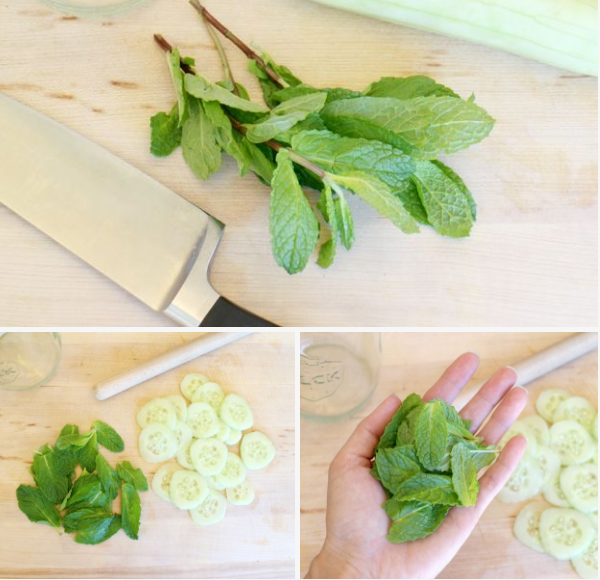 Remove the mint leaves from their stems and pile them in the palm of your hand. Give them a couple of good whacks. (like horizontal clapping!) This releases the flavor. Cut 2-3 slices of ginger if you'd like to add a bit of spice to the mix. Put all the ingredients into one of your jugs and use the end of the wooden handle to muddle them. If you're making more than this one recipe, set this one aside and move on to the next step. If not, skip to step 5. Wash a navel orange and cut off the end, then cut three nice thick slices. Cut each slice into quarters. For the adventurous taste buds out there, remove the needles from a small rosemary spring to add to the mix. If you're making more than this one recipe, set this one aside and move on to the next one. If not, skip to step 5. 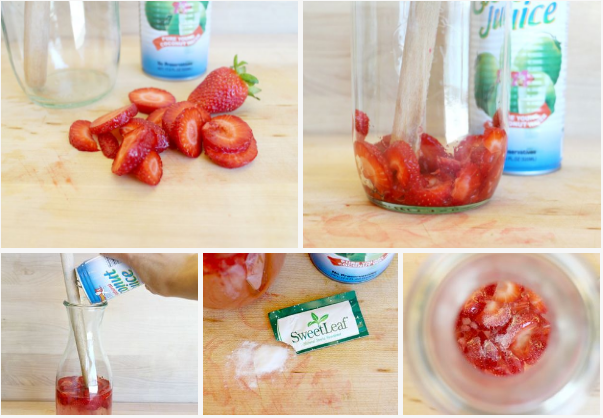 Cut three washed organic strawberries into slices and put into one of your jugs, using the end of the wooden handle to muddle them. 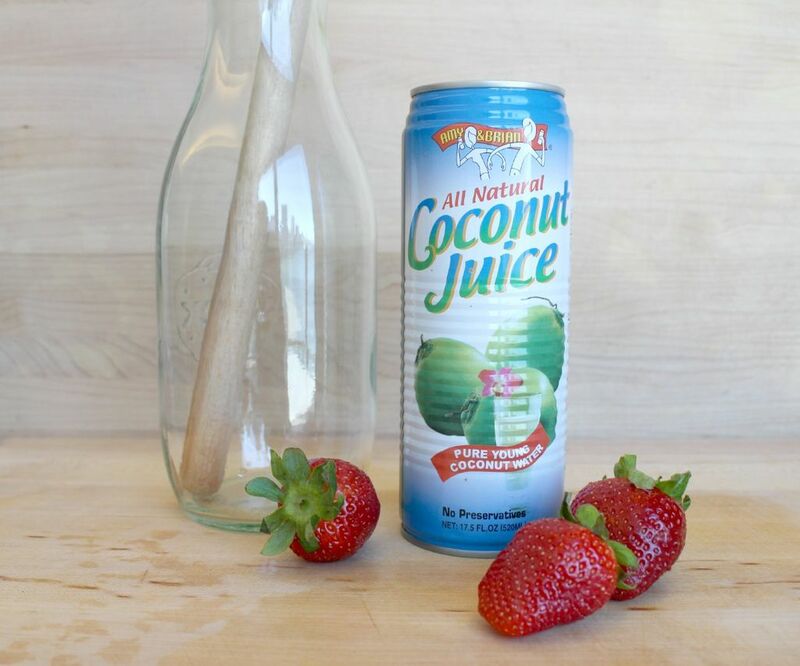 Open your coconut water and empty it into the jug. If you'd like to add a bit of sweetener, I recommend stevia, which is derived from a plant and better for you than processed sugar. A few pinches is plenty! 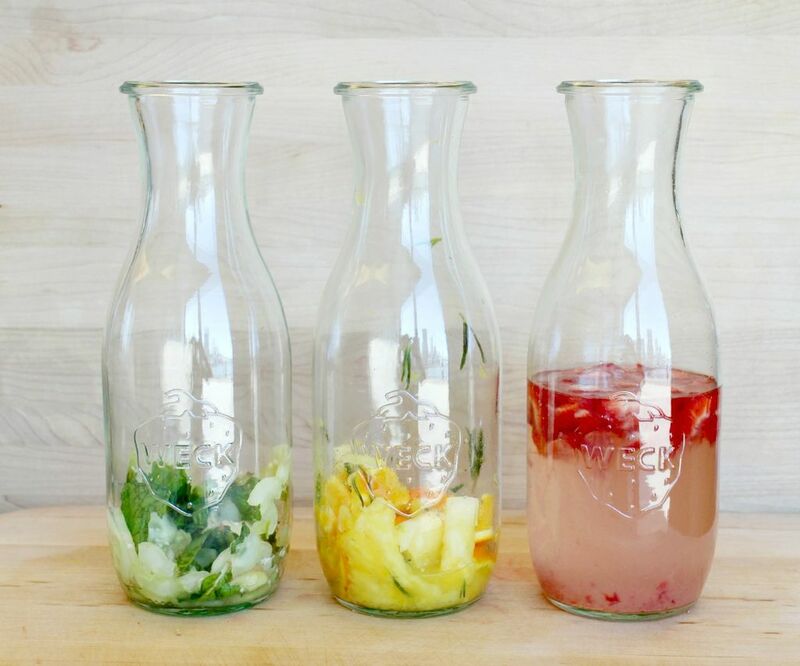 Now that you have your ingredients all muddled and tucked away in their jugs, it's time to add the water. I'm a huge fan of still (tap) water, but these would also be delicious if you used sparkling water instead. If you like ice in your drinks, add a handful of ice to each jug, then fill them up with water. These will be good for up to a week if kept in the fridge and you can refill with water at least two more times before having to start over with fresh ingredients. The taste will lessen with every refill, but will still be delicious and more exciting than plain water. If you have your own recipe that you love, please share it in the comments section below! And if you do try one of mine, please hit the 'I Made it Button'!